A lazy Saturday night at home calls for a nice bottle of craft beer, so I picked up a bottle of Bach Brewing’s Billfish APA. This Kiwi-as craft brewery has never disappointed me in the past, so I figured it was a safe choice… fingers crossed! Bach Brewing: At the heart of Bach Brewing is our passion for craft beer and love for the Kiwi Bach, a symbol of homegrown escape, simple relaxation and freedom. I’ve reviewed a grand total of five beers by Bach Brewing previously: Beachstone Pilsner, Driftwood Session Pale Ale, All Day Extra Session Ale, Witsunday Blonde IPA, and its Duskrider Red IPA. Blurb on the bottle: New Zealand’s coastal waters have been dubbed an Angler’s El Dorado. Worthy of an angler’s thirst, BILLFISH APA is brewed with loads of juicy Aotearoa and American hops. The review: This beer wasn’t crowned best pale ale at this year’s Brewers Guild of NZ Awards for nothing. Indeed, Bach Brewing’s Billfish APA is a superbly balanced beer. It’s got all the kick you’d expect from an APA, but at 5.8% ABV it’s lighter and therefore much more drinkable than many others out there. It won’t completely obliterate your taste buds, and yet it smacks of pineapple, mango, orange, and apricot. The verdict: Bach Brewing’s hot streak continues. 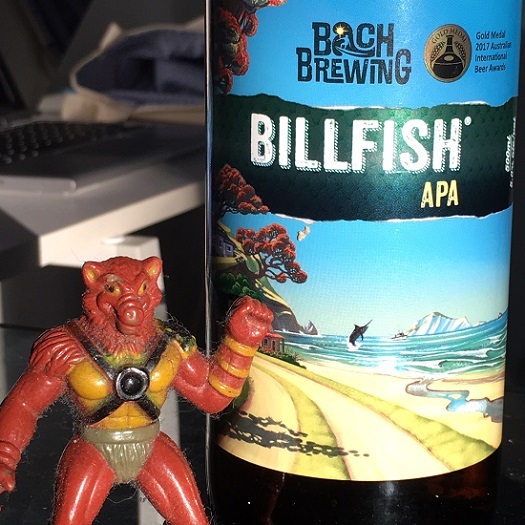 Billfish APA is totally bodacious, dude!